Bright and welcoming lakefront home! Come and enjoy Lake Winnisquam in this beautiful home perfect for a summer getaway. Children have plenty of room to play in a huge yard, with enough room for a whiffle ball game, swing set and private beach. Walk down to the end of the dock for a relaxing day of fishing, or take the rowboat out for an even better experience. The house is placed in a no-wake zone, meaning gentle boat traffic and an amazing swimming environment, floating raft included. Also, you're within walking distance of an 18-hole mini-golf course the Winnisquam Market for Ice-cream. Drive 4 miles for golf at Lochmere Country Club or shopping at Tanger Outlets. After a long day of play, gather around a fire in the outdoor fireplace for delicious S'mores, or retire indoors for a movie. When it's finally time to hit the hay, everyone can make their way to one of the many bedrooms to get rested for the next day of fun under the sun. New Kitchen/Dining/Living Room Remodel Completed June, 2018. First floor bedroom remodel completed Oct 2018! Entryway and first floor bath remodel to be completed in time for summer 2019 vacations. Modern bathrooms with separate hot water heaters to allow simultaneous showers/bathing. Huge Living Room furnished with a Sectional and Recliner on one end and a Sofa and Loveseat at the other end to comfortably seat 14 people for Movie Nights on Flat Screen TV. New flooring 2018. Stainless side by side Fridge/Freezer new May 2018. Ceramic cooktop with 5 burners. Double oven, Cooktop. Built in Microwave above. New built in summer 2018. Seating for 14 with open concept to Kitchen and Living Room!. DVD Player as well as VHS Player and Nostalgic VHS Tapes for your enjoyment. Children's books in upstairs "Winnie the Pooh" Bedroom. Level grassy yard perfect for lawn games. 3 Miles from Lochmere Golf Course. As usual a wonderful vacation. This was the perfect place for our 2 families to enjoy ! Warm and cozy and fun all around! We loved it here - the location was perfect. Near enough to everything but far enough away to feel like a real escape. We had 2 families together on and off and found it roomy enough to have some alone time as well as some wonderful group gatherings. Plenty of cozy atmosphere and the beautiful beach/swimming area cannot be beat! The owners were also easy to deal with and made us really feel like this was "our place" while we were there. Definitely returning next year. it is with great pleasure that I give a positive review. We entered the house with clothes and food and everything else was there. Cindy and Jay thought of everything to make our stay comfortable. from the toy room for the little ones to the comfortable beds for the adults. The kitchen had everything you could want or need to cook. Then there was the beach which we all enjoyed immensely. Would we recommend this home ? in a heart beat. Would we go back you bet !. Thank you Cindy and Jay for letting us use your home! I vacationed with my children and grandchildren. There was plenty of room and privacy for all. We brought our own boat and had no problems using the town's boat ramp. This cottage provided a dock for our boats parking. 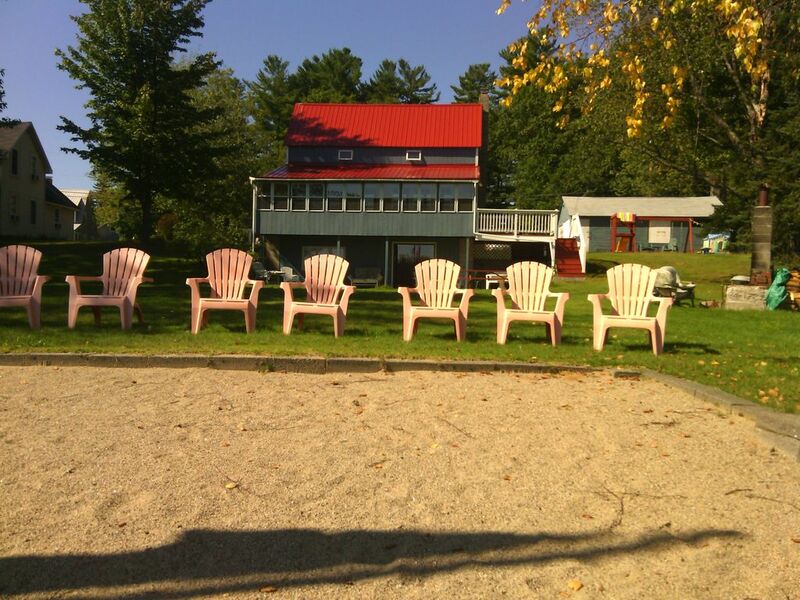 There are plenty of outdoor chairs to relax on and we had a fire in their fire pit every night. Plenty of beds and we were able to all sit together at one table for dinners. It was perfect. Thank you ! Fabulous yard and great location! Perfect rental for a family gathering! We had three families (siblings) in the house for a week and had a wonderful time. The yard can't be beat, the kids loved the raft and the paddle boat, and all the outdoor seating was awesome. The dock was great for our 21' boat as well. The interior is obviously dated but everything worked, and there was a great brand new oven/cooktop and all the kitchenware you could need. There is no AC but they have window fans for basically every window so it's easy to get the house cooled down at night. Swimming, boating, fishing and scenic drives in the heart of the NH Lakes region. Located on a quiet street yet only minutes to major shopping and restaurant areas and Route 93. Walk to mini golf or a country store for convenience items. Lochmere Country Club golf course and Tanger Outlet Mall shopping just a 5 minute drive. Owners will greet you on arrival and tour property with you to make sure you have everything you need for an enjoyable stay. An entry code will be provided at check-in.